Successfully Added 9 Inch LCD Monitor for In-Car Headrest or Stand to your Shopping Cart. 9 Inch LCD Monitor for In-Car Headrest or Stand - a quick and affordable way to transform your boring ride into a fun and entertaining experience. Featuring dual video input connections, this high resolution 9 inch LCD monitor lets you show everything from your DVD player, GPS navigator, digital TV receiver, rearview parking camera, and any other video sources directly onto its large and clear screen. 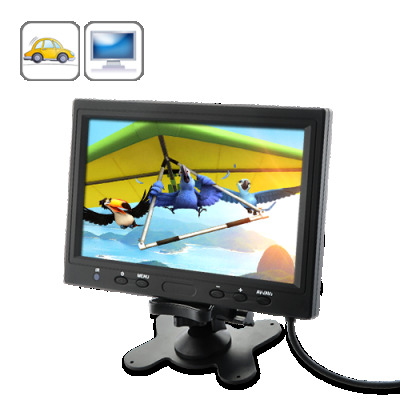 With this headrest monitor (also known as dash mount monitor), you also get an impressive display resolution of 800 x 480. This allows you to enjoy beautiful high resolution widescreen images that really bring your movies to life. It also comes with a fully adjustable mounting bracket that can be placed on your car's dash board. Or with a little handy work you can use the built in bracket to mount this device into the back of your headrest. With its slim profile you can literally mount this device anywhere you like. Does this device come with speakers?